We love Colorado and the mountains. On this day we went wheeling on the Ophir Pass, found a little snow at the pass, elevation 11,789 ft. The views in every direction are just spectacular. Wild flowers blooming in the mountain meadows. 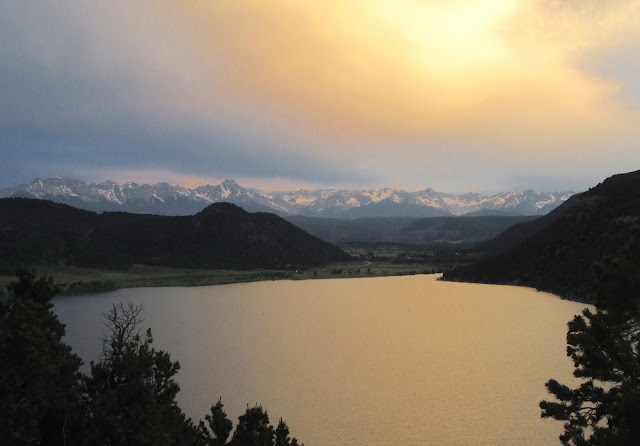 After camping in Ouray for a couple nights we moved to Ridgeway State Park about 20 miles from Ouray. Ridgeway is also a beautiful area, this photo was taken at sunset from a trail behind the Visitor Center in the Park. Back in Winslow AZ, we've seen some amazing sunsets here, (no photo editing). We liked the north rim of the Grand Canyon much better than the south. I think mostly because it is way less crowded and touristy. You can walk around and find places to sit and look at the canyon and be alone (for the most part). We drove out to several points (above) and were the only people there. Waiting for a sunset that never really materialized because of the clouds, none the less the Grand Canyon is ever changing with the clouds and light of the day, it's a magical place. The clouds and little rain showers that popped up added to the show. June 2015 - Leaving Taos NM, heading for Arizona. This is probably my favorite of all the missions we visited, I like the simple lines and adobe construction. 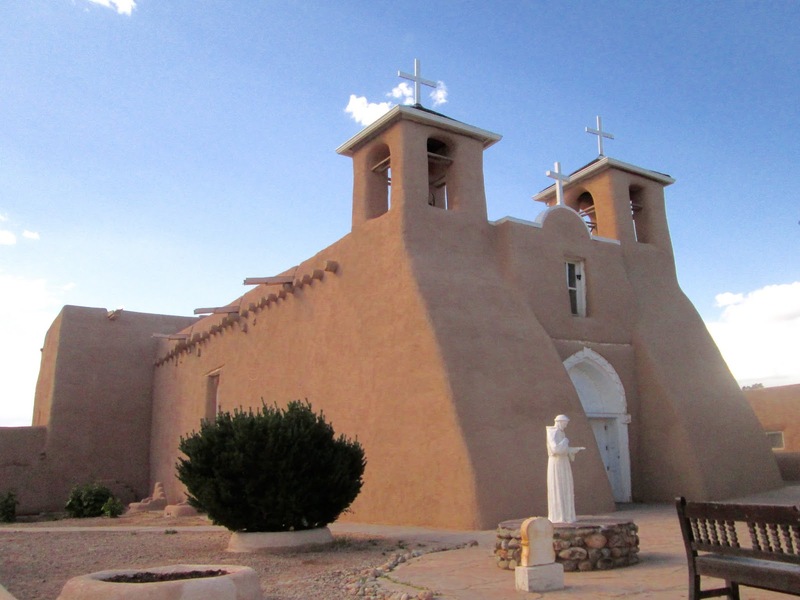 San Francisco de Asis Mission Church is in a historic district of Taos. After several years of construction, the mission was completed in 1815. 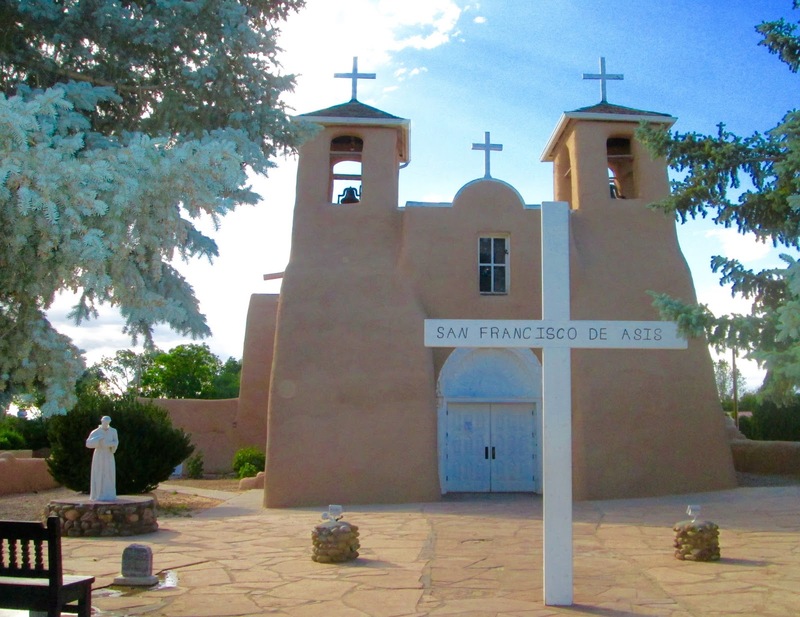 The Taos Chamber of Commerce claims it is one of the most photographed and painted churches in the world. Photographer Ansel Adams and painter Georgia O'Keeffe to name a few of the artists. The mission was the center of a fortified plaza. Plazas were enclosed with thick walls which offered protection against Indian (Comanche in this case) attackers. The plazas also served as gathering places for the community. Flagstaff AZ, The Great Race. We learned the Great Race was coming to Flagstaff and decided to check it out, so glad we did, it's such an amazing event which we knew nothing about, until now. 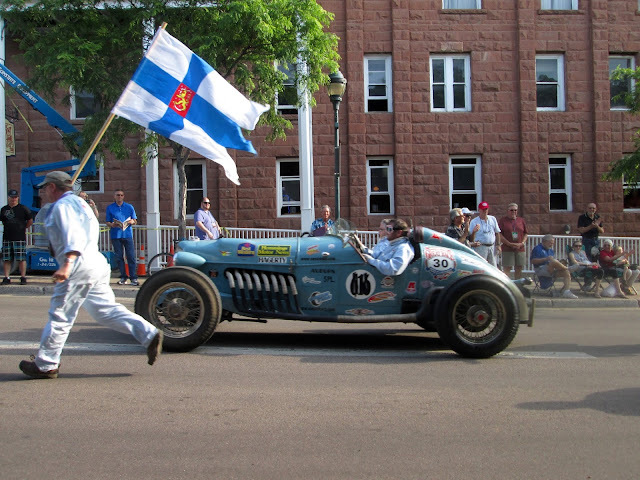 The Great Race is a world famous old car rally that's been in existence for 33 years. It's a 9 day race that covers over 2,000 miles in vehicles 1972 or older. This year the race started in MO and ended in CA, traveling over sections of old Route 66 which brought the rally thru Falgstaff. The cars each have a driver and a navigator. They're given precise instructions everyday that detail every move down to the second. It's not a race of speed but of time. They are scored throughout the day at checkpoints. Following the precise instructions is key and the primary job of the navigator. People lined the streets and cheered as the cars pulled into Flagstaff. These proud guys were from Finland. There were also a couple teams from Japan. I liked the tow truck, who would ever think of entering a tow truck in a road rally. A rather unusual custom built car. From looking on their web site, this car was the overall winner. The cars lined the streets for a few hours making for an amazing car show. We talked to a husband/wife team (so interesting) and saw they placed in the top 20...cool. If you're interested in entering, save your coins, the entry fee is $5,500.00. The winner is awarded a cool $50,000 in prize money. Next year the race will be following the Lincoln Highway, starting in CA and ending in IL. We'd love to see the race again, it's very possible with our moving home.